Associated Spot Welders has over 60 years of experience in providing Nadcap certified spot welding to Southern California’s aerospace industry. Our excellent workmanship, honest business practices, and timely delivery of high quality welding services has earned us the trust and respect of hundreds of aerospace contractors and suppliers throughout the City of Los Angeles, Long Beach, Santa Clarita, Anaheim, and surrounding areas. We are certified by the National Aerospace and Defence Contractors Accreditation Program (Nadcap) in the proper application of spot welding techniques and the use of specialized electric resistance welding machinery. Associated Spot Welders is proud to be an authorized vendor for the Boeing Company. At Associated Spot Welders, we understand the need for expert workmanship that is completed on time and in budget. That’s why we make it our priority to deliver the highest quality, Nadcap spot welding at reasonable rates. Our team of professional welders has over 10 years of experience each, and are well versed in the industry’s best practices for resistance spot welding, stud welding, and projection welding. 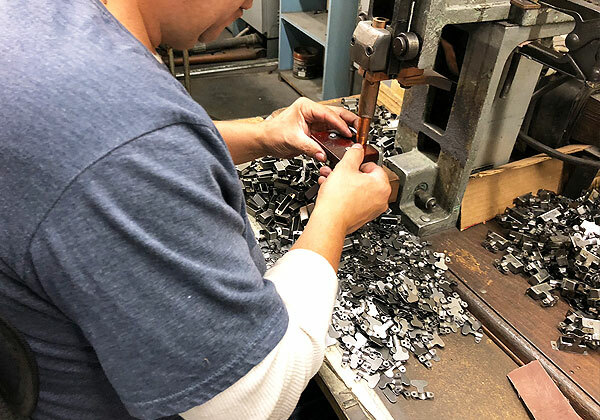 Whether you need to weld 50,000 steel airplane armrests in Los Angeles, 200 aluminum machine parts in Pomona, or a production line of stainless steel components in Long Beach, we have the skills, equipment, and experience to get the job done according to your exact specifications. Our advanced spot welding machinery is geared to weld a wide variety of aluminum, steel, stainless steel, and brass workpieces that are up to ½” in diameter. Spot welding robots use a process of resistance spot welding to fuse together metal surface points by utilizing electrical current. When operated by our skilled technicians, this process creates long-lasting, durable, and spot specific welds that are designed to resist fracturing and disruption even under extreme temperatures, altitudes, and weather conditions. Contact us today or stop by our City of Industry workshop to speak to a member of our knowledgeable staff. We offer convenient onsite drop-off and pick-up services, and are fully equipped to handle out of state orders. When your job has been completed, we will ship your products back to you at a reasonable cost.